In busy areas, it may be difficult to locate one particular station or object on the map. The Locate function helps you pinpoint a particular station or object on the map. First, select the station or object you want to locate. A list of all known stations and objects will be displayed for you to select the desired station. If you want to find a station not yet heard by your station, type its callsign into the dialog, and press OK; an APRS position query packet (?APRSP) will be transmitted through all APRS-transmit-capable ports to the requested station to try to get a position response. 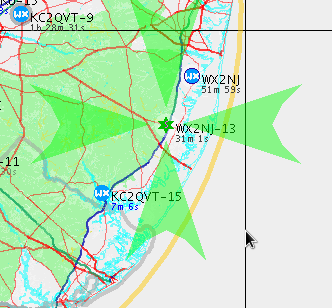 If any sort of position report for the station or object has been received, the map will be panned to center the most recent position report of the station or object, and the position will highlighted by flashing green arrows.